Many years ago, when I was a student at university, my now mother-in-law graced me with a gift that has lasted me for a lifetime of great cooking—a slow cooker. And while I have made a career writing cookbooks and teaching people how to cook, I still pull out my trusty kitchen workhorse at least once a week. One of the most requested slow cooker meals in my household is pulled pork poutine. Slow cookers are designed to cook food at a consistent temperature for hours, and unlike other pots you leave on the stove or oven, you can safely leave a slow cooker unattended on the counter. 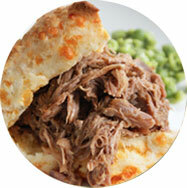 Cooking pulled pork into heavenly succulence is practically foolproof in the slow cooker. It’s nearly impossible to overcook, but you can’t rush it. The pork is done when it’s so tender you can literally poke it and it falls apart with a fork or tongs. I like to use a boneless shoulder and cut it into smaller chunks for easier handling, especially if you have a smaller size (4 quart) slow cooker. Browning the meat helps to render some of the fat and create another layer of flavour, but if you are cut for time, skip this step. You can use any size of cut you want, but a 4- to 5-pound roast will give you roughly 10 cups of shredded meat. If you don’t use all the pork, it can easily freeze and you can package it into 1-cup portions, which makes it easy to thaw and to use for another dinner down the road. Be sure to add some of the cooking juices too, which will keep it moist when reheating. Nothing beats rifling through the freezer and coming across a package of frozen pulled pork—just when you thought you had nothing to eat! Almost every cuisine has its own uses for pulled pork and the French Canadians are no exception. Standard poutine consists of fries, gravy, and cheese curds, but for this recipe we oven roasted Ontario potato wedges and used the cooking juices of the braising liquid to make the gravy. It takes this dish over the top and makes it totally decadent. So enjoy this twist on a classic Canadian dish and bon appétit! In a large Dutch oven or deep pot, cook bacon over medium high heat, stirring for about 5 minutes or until crisp. Transfer to a plate lined with paper towels. Set aside. In batches, add pork (shoulder or roast) to skillet and cook, for about 4 minutes or until browned all over, adding oil if needed. Using a slotted spoon, transfer to slow cooker. Add garlic, onions, thyme, smoked paprika, bay leaf, salt and pepper to skillet and sauté for about 5 minutes, or until fragrant. Add onion mixture to slow cooker. Add root beer and vinegar to skillet, bring to a boil and cook for about 5 minutes, scraping up any browned bits from the pan. Pour over pork mixture in slow cooker and add reserved bacon. Cover and cook on LOW for 8 to 10 hours or on HIGH for 4 to 5 hours, until pork is fork tender. Lift the pieces of pork out of the cooking liquid and transfer to a large bowl. When cool enough to handle, use two forks or your fingers to shred the meat into pieces. Remove and discard bay leaf and any large pieces of fat. Strain the cooking liquid into a measuring cup (liquid should measure 4 cups). The vegetables can be chopped and mixed in with the pork if desired. Pour cooking liquid into a saucepan. Set aside. Poutine: Preheat oven to 400 ° In a large bowl, toss potatoes with oil, salt, and pepper. Spread on a single layer on a rimmed baking sheet lined with parchment paper (or a 9 x 13-inch casserole dish). Bake for 40 to 50 minutes, stirring once or twice, until browned and tender. In a bowl, whisk together cornstarch and water. Pour into reserved saucepan with cooking liquid. Bring mixture to a boil, simmer for 5 minutes, until thickened. To serve, divide potatoes evenly among individual serving plates. Spoon pork on top of potatoes and top with cheese curds. Ladle gravy over pork and potato mixture and garnish with chopped parsley if desired. Oven Variation: Heat oven to 325 °F. Place oven rack in the lower middle of the oven. Prepare recipe as directed above. Cover Dutch oven with lid and place in the oven. Cook undisturbed for 2 hours, then begin checking every 1/2 hour. Pork will be done when completely fork tender (when the meat can be easily pierced with a fork, without any resistance and easily falls apart without any pressure).